Monster Energy drinks are high caffeinated drinks that are popular among those looking for a quick energy boost, including athletes and shift workers. Monster Energy drinks are potent drinks that offer a powerful buzz. If you are sensitive to stimulants or have high blood pressure, you should avoid these drinks. Even if you are a healthy adult, you should consume Monster Energy drinks in moderation since many of the ingredients will increase your heart rate. The primary ingredient in Monster Energy drinks is glucose, a type of sugar. A 16 oz. Monster Energy drink contains 54 g of sugars. Glucose is obtained from the breaking down of sugar and starch in carbohydrates. This form of energy then is absorbed into the bloodstream by the small intestine and combines with insulin to enter the muscles and brain. According to the National Institutes of Health, glucose is a major source of energy for most cells of the body. Taurine is an amino acid that supports neurological development and helps regulate water and mineral salt levels in the blood, notes MayoClinic.com. A 16 oz. Monster Energy drink contains 2 g of taurine. Studies suggest that taurine may improve athletic performance and when combined with caffeine, may improve mental alertness; however, more research is needed to verify these findings, MayoClinic.com adds. 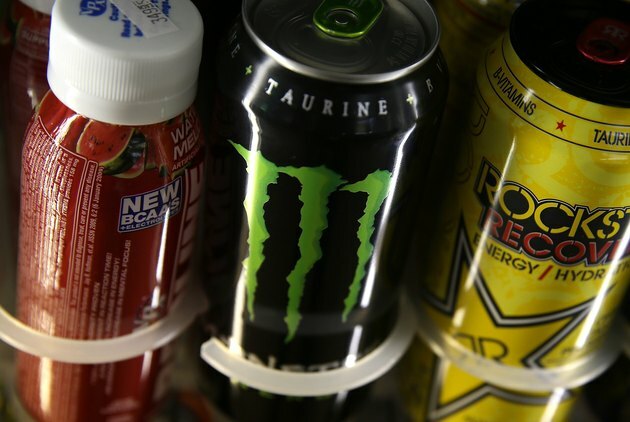 Caffeine is one of the main ingredients in Monster Energy drinks. According to the National Institutes of Health, caffeine stimulates the central nervous system, increase alertness and can provide increased energy for powerful workout routines. L-carnitine is an ingredient in the Monster Energy blend complex. It is an amino acid that helps the body convert fat into energy. Although L-carnitine is a popular addition to many energy drinks and dietary supplements, the University of Maryland Medical Center and the Linus Pauling Institute at Oregon State report that there is no proof that it can increase athletic performance. Other ingredients include carbonated water, natural flavors, sucrose, citric acid, Panax ginseng root extract, sodium citrate, inositol, color added, benzoic acid, sorbic acid, sucralose, guarana seed, cyanocobalamin, niacinamide, glucuronolactone, maltodextrin, sodium chloride, riboflavin and pyridoxine hydrochloride. MayoClinic.com: Taurine is Listed As An Ingredient In Many Energy Drinks. What is Taurine? Is It Safe?